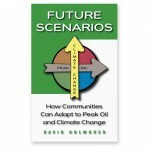 In Future Scenarios David Holmgren depicts four very different futures depending on mild or destructive climate change combined with either slow or severe energy declines. In his latest essay he suggests that we are now in the Brown Tech scenario, where the effects of peak oil is having less impact that expected whereas impacts of climate change is more severe than anticipated. Failure of intergovernmental negotiations and mass social movements to make real advances in addressing climate change has given us little hope for the graceful energy descent that many would prefer. Instead, implosion of the global financial system appears to be our only solution to dramatically reduce carbon emissions. While a terrifying outcome, it may be the only thing that can prevent catastrophic climate change. David argues that if 10% of people from the global middle class reduce consumption by 50% and convert 50% of their assets to building household and local community resilience, then the fragile global economic system could crash sooner rather than later. Frightening as this seems, the longer massive economic contraction is delayed the more likely the affects of runaway climate change will eventuate. Essentially we must change from being dependent consumers to responsible self-reliant producers, using less energy in the process. We need to turn our backs on the big banks and corporations, grow our own food, provide for as many needs as we can more locally and support local enterprises. We should take steps now to build resilience, downsize, radically reduce consumption and put savings into concrete assets that build the local economy as quickly as possible. By doing this we can provide a valuable model and resource for our local communities while improving our quality of life for the difficult times that lie ahead. Crash on Demand is a follow-up to David Holmgren’s earlier Future Scenarios (2007) and Money vs Fossil Energy (2009) essay. David stresses the importance of comprehending these previous works before reading his latest essay. Read the free pdf of Crash on Demand: Welcome to the Brown Tech Future. Rob Hopkins, Nicole Foss, Dimitry Orlov and Albert Bates have been contributing the sometimes heated discussion in response to Crash on Demand on resilience.org. For tips on how to prepare for economic collapse, check out Nicole Foss’s How to Build a Lifeboat – with emphasis on getting rid of debt and looking after your health. David’s essay ‘Crash on Demand’ was the primary influence in framing the 2014 Great debate at the Sustainable Living Festival in Melbourne. With an audience of over 250 it was an opportunity for David to explain the logic of bottom up permaculture activism in response to the energy descent future and hear some of the other perspectives presented. Noticed “decent” should probably be “descent”. Thanks Even – fixed that. I’ve also just included a video interview that David did for Pip Magazine about this topic.